I was a research assistant in Berlin, Germany, working with a group that was studying Environment, Technology and Social Change. In short, I wrote and reviewed articles, case studies and grant proposals, analyzed social research data and prepared speeches and materials for the senior researchers. 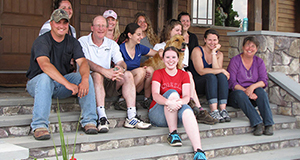 At the time, the MAPP was the only degree in the U.S. that directly prepared students for a career in animal welfare, advocacy and human-animal relationships. I wanted to work in animal welfare, but I wanted to do it with a high-quality academic background in the core issues. The MAPP exposed me to so many different aspects of animal welfare and policy which I’m sure I would never have been drawn to on my own. Because a career in animal advocacy often requires a great deal of flexibility before specialization, I have applied my background knowledge of the key issues on a variety of topics from wildlife law to the science of the human-animal bond. The background preparation has also been important when it comes to networking in the field, because it makes a difference to be able to converse knowledgeably (or at least ask the right questions!) when meeting anyone, from veterinarians to conservationists. During my MAPP course work I completed two significant projects. The first was a published study on the impacts of assistance dog ownership in the pediatric population, which my project partner and I presented at an ISAZ conference. Although I didn’t come into contact with the field of human-animal relationships for many years afterward, this background gave me the context and understanding to pursue some of my more recent research and program goals. My final project was an analysis of the implications of Germany’s constitutional amendment to include the protection of animals, which was ultimately selected for publication in Animal Law. I think that having the opportunity to complete and publish a solo project of that scope gave me credibility early in my career, in addition to the confidence that I could handle some of the crazier assignments that got thrown at me. In the course of my research for that project I came into contact with some key people at IFAW, and out of one of those conversations came an internship…and then a short-term position…and then a full-time position. I really enjoyed the camaraderie of the students, who grew to trust one another enough to wrestle meaningfully with a wide variety of topics. I also enjoyed some of the major assignments, which gave me an opportunity to go deeply into concepts and understand the layers and layers underpinning humans’ motivations in interactions with animals and decisions in animal policy. I came out of the program feeling more confident about my ability to ask the right questions, even if I don’t yet know the right answers. The MAPP program is unique in that you get out of it what you put in. Those students who come willing to work hard and push themselves, with an open mind and a willingness to surprise themselves, will get tremendous value. A degree in Animals and Public Policy is like starting a journey that never ends, because you will continue to want to learn and engage in those issues which you may or may not encounter in your daily career. It is also important to mention the terrific network of MAPP alums who are supportive and helpful to one another, not just immediately after graduation but for years after.